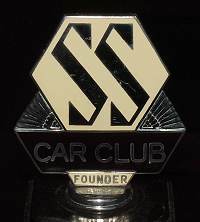 The SS Car Club was founded in early 1933 by a group of enthusiastic SS owners but nearly suffered an early demise when, in 1935, the then treasurer disappeared with the club funds! It was very unfortunate that at the time, Willian Lyons was making the fastest time of the day in the prototype SS90 at the Club's Blackpool Rally. He was less than amused when he was told of the incident and discovered he would have to pay the total cost of the rally himself! As a direct result, the SS Car Club was soon reformed under the guidance of SS Cars Ltd and William Lyons appointed Bill Rankin the Secretary to make sure things ran smoothly. You can see his signature on many of the SS Car Club letters on this site. Shown is a very rare original SS Car Club Founders Badge, restored in 1991 by P D Enamels. Only a very few original Founders badges survive. The colouring of the background is a little more yellow than shown here - a creamy yellow is in fact the background colour to nearly all SS Car Club correspondence. Founders badges differ from normal SS Car Club badges in that the maker's stamp appears on the circular base of the badge rather than on the back and the letter 'B' only is shown rather then 'Birmingham'. There are many reproductions around now of this and the ordinary SS Car Cub badge. Fortunately, if you know how it is very easy to spot all repros, no matter how good the maker thinks it is. If anyone is in doubt, please email me a decent close up photo of the badge front and base!